That’s probably true, but depending on how long and in what conditions the old motorcycle has been sitting, it probably doesn’t run so great anymore. Old gas turns to varnish and solidifies in the carbs. Rubber seals, o-rings, and manifolds get hard and brittle. Plastic parts start to crumble. Rust starts to form, and water and condensation can start to seep into places where it’s not supposed to be. 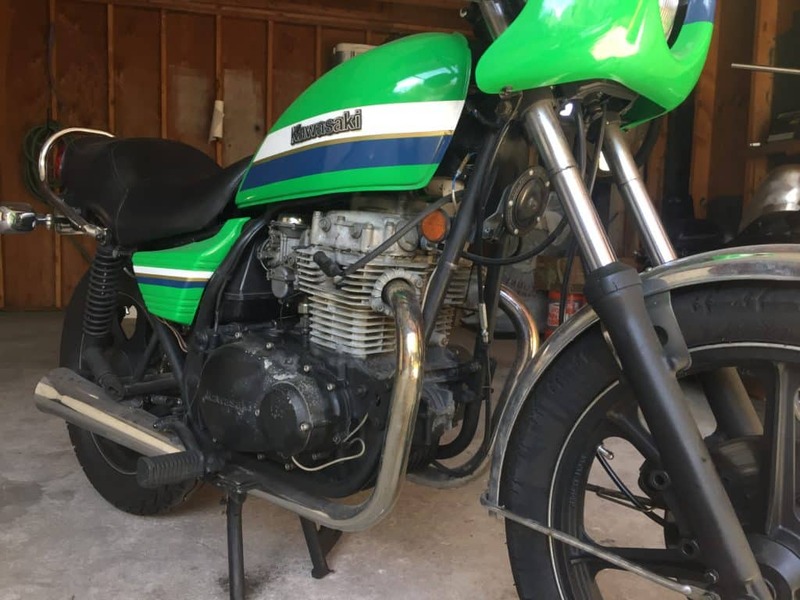 When you’re responding to a local ad for an old motorcycle, you might not always have the ability to do the most comprehensive check possible. However, some simple inspections will at least give you a better idea of what kind of motorcycle project you’re getting yourself into. The more you know, the better you’ll be able to estimate how much work you’ll need to put in and how much it’s going to cost you. This’ll help you make sure you’re paying the right price. You can use this page as a used motorcycle inspection checklist to make sure you buy the right bike for your project. The obvious place to start your evaluation is with a visual inspection of the motorcycle. Take a walk around, under, and into the bike to check for any major damage. Dirt and grime is okay, but you’ll want to look for any signs that the bike was dropped or crashed at some point. Keep an eye out for parts you’re definitely going to need to replace. Inspect the frame tubes to make sure they’re not bent or rusted out. Check the engine cases for any cracks, holes, or dents. With the visual inspection complete, move in for a closer look at the engine. Try to see if the engine turns over – either with the kick started, electrical starter (if it has power), or by putting the bike in gear and trying to roll it. If the engine won’t move, you may have a seized piston or some other internal problem. You’ll at least need to rebuild the top end if not the entire engine. You can check the motorcycle’s compression if the engine turns over. If you don’t have a compression gauge, you can remove the spark plugs and place your thumb over the spark plug holes. If the motorcycle engine has decent compression, it should push your thumb off the hole when you turn the engine over. While you’re up close to the engine, take a second pass for any cracks, bends, or other signs of damage. A full engine rebuild is one of the most expensive things you can take on for an old motorcycle rebuild or restoration project. Take a look at the spark plugs that are in the engine for signs of oil or gas fouling. If the plugs are too lean and the bike has low compression, that may be a sign that there’s a hole in the piston. You can also check the oil. You’re looking for looking for any discoloration, strange smells, and any metal or foreign particles. If the battery is good, you can check for spark. Remove the spark plugs and ground them to the engine and hit the starter. If the battery is old, which is most likely, you can remove the old battery from the bike completely and connect the motorcycle’s positive and negative leads to jumper cables hooked up to a 6 or 12 volt car battery. Don’t try to jump an old motorcycle battery. As best you can, try to trace the wiring harness to check for any modifications, breaks, or excessive corrosion. Try to start the motorcycle if you can. If it starts up and dies right away, a good carb cleaning and a new battery may be all it needs to run again. For a motorcycle that won’t start at all, you may be looking at some bigger fixes such as a top end rebuild, a starting system rebuild, etc. If it has a points ignition, it’s relatively inexpensive to replace the entire points plate. If the bike has an electronic ignition, a replacement or repair may be more expensive. Your evaluations above will give you a much better idea of what’s going on with the motorcycle you’re looking at, and what it’ll take to fix it. Before you even go to check out the bike, it’s a good idea to do some homework to see what the price of the common replacement items are for that particular model – carb kits, piston rings, gaskets and seals, ignition marks, etc. Be honest with yourself about what kind of motorcycle project you’re looking to get into. The more knowledge you have coming into the negotiation and after looking at the bike, the better price you’re going to get. Otherwise, you’re likely to put in more money fixing the bike than the entire thing is worth! Missing parts – signals, mirrors, gauges, lights, cables, master cylinders, etc.